The 18-hole Bent Creek Golf Course in Jacksonville, FL is a public golf course that opened in 1989. Designed by Bobby Weed, Bent Creek Golf Course measures 6420 yards from the longest tees and has a slope rating of 136 and a 71. Designed by renowned Bobby Weed, Fleming Island captures the essence of the northeastern Florida landscape. While playing the front nine you have to hack through the notorious low wetlands of thick palmetto bushes and Spanish dagger, and weave dubiously through a smattering of lakes and marshy quarters. Amelia River Golf Club prides itself on being one of the best-conditioned golf courses in the area, boasting large, smooth TifEagle greens that are carefully sculpted around forested parkland. Due to the abundance of trees on the golf course, ball placement and accuracy are integral to doing well. The Golf Club at South Hampton is considered one of the best values in the area. Unlike many other courses in northeastern Florida, there is actually some movement in the landscape, which was fully utilized in the design. For golfers seeking to soak up the seemingly endless array of daily fee golf offerings, this anonymity is part of the allure. Beginning at State Highway 210 at the north end of St. Johns County (approximately three miles south of Jacksonville and Duval County) and stretching south to State Highway 207, there are seven golf courses within two miles of the interstate, most built within the last four years. Another 20 miles in each direction brings in nearly two dozen more. As to why the sudden boom here, the simplest of answers might be the best: it's where the people are. Architect Clyde Johnston says "I speculate that the I-95 corridor is desirable since traffic around Jacksonville has become more congested. [It] could be the World Golf Village aspect also." Jacksonville lays claim to around 70 golf courses, most of which are available to the golfing public. Further cementing the First Coast's reputation as one of the true golf capitals of the south, the PGA Tour and Senior PGA Tour headquarters are in Jacksonville and the World Golf Village is a chip shot away in St. Augustine. As for the lay of the land, Jacksonville and its environs are ill suited for most types of agriculture. Sandy soil and pine-packed parcels set up much better for (you guessed it), golf. The courses of the First Coast generally require accuracy above all other elements of the game. But there's enough variety in this not so little slice of golf heaven to keep ever make and model of golfer satisfied. Some of Florida's best coastal courses can be found in and around Jacksonville and St. Augustine. If you're flying, Jacksonville International Airport serves most of Florida's Northern Atlantic Coast. JIA has daily departures and arrivals to most major cities on all major US airlines. JIA is part of the Jacksonville Airport Authority, which also contains three other smaller airports. Craig Airport, Herlong Airport and Cecil Field are located through the Jacksonville community and may be able to get you closer to your destination. If you're driving, you'll probably take either I-95 or I-10. I-95 runs north/south along the East Coast, from Washington D.C. to Miami. It will take you into Jacksonville. If you are driving from the West, you'll likely take I-10, which traverses the entire South, from Los Angeles to Jacksonville. I-10 which connects Jacksonville with Tallahassee and the rest of Florida's Panhandle coastline. If you want to take a scenic drive along the western seaboard, you can take Highway 41 from Miami, through the Everglades and north to Tampa. Highway 98 runs along the coast of the Panhandle west to Pensacola. One of the best ways to shave strokes from your handicap is to attend a golf school, and the golf-rich east coast of Florida and the Orlando area are full of them thanks to the area's many attractions and winter allure. Here are five you should consider. The Jacksonville area offers dozens of public golf choices, great weather and terrific dining at an array of price points. But why should you plan a golf vacation to the Jacksonville area? Mike Bailey offers up 10 compelling reasons, from the World Golf Hall of Fame to the mild weather and ocean breezes. Just minutes from the Atlantic, Jacksonville Beach Golf Club has all the elements of coastal golf -- wind, a good amount of sand and plenty of water. The golf course is also walkable and very affordable, making it a favorite among local players since 1960. 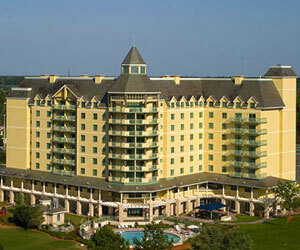 The Ocean Links Course at the Omni Amelia Island Plantation Resort is known for its ocean views. Even though only five holes of this Bobby Weed-designed course are on the Atlantic Ocean, they are striking and difficult, as Mike Bailey shows us in this photo gallery. The Golf Club of Amelia Island features wide fairways and receptive greens, while utilizing the natural beauty of the barrier island. Golfers never quite see the Atlantic Ocean, but they can hear it from several spots. There are several excellent stretches on this playable resort layout. The fourth and sixth holes play brilliantly over ponds to their respective greens. Sandwiched in the middle is the photogenic signature hole, the 160-yard fifth, featuring more water. The first impression of Eagle Landing at Oakleaf Plantation is a doozy. Players are greeted by a waterfall flowing behind the 10th green. Designed by Clyde Johnston in 2006, Eagle Landing has earned a reputation among its customers as a playable layout that's always in good condition. It's got enough surprises -- like its own version of the church-pew bunker at Oakmont -- to keep golfers coming back. The ingredients for a successful buddy trip are simple: a comfortable room, an ice chest filled with your favorite beverages, good eats, entertainment options and quality golf. If you're heading to Jacksonville, Fla., Mike Bailey has some suggestions on how to make the most of your golf vacation. Before there was the PLAYERS Stadium Course at TPC Sawgrass, there was Sawgrass Country Club. This 1973 Ed Seay design played host to The Players Championship from 1977 to 1981. Although there are 27 holes, the East-West combination is the course to play. Sawgrass is still capable of testing the best players in the world, especially if the wind is blowing. Golf in grand style at The Palencia Club in St. Augustine, Fla.